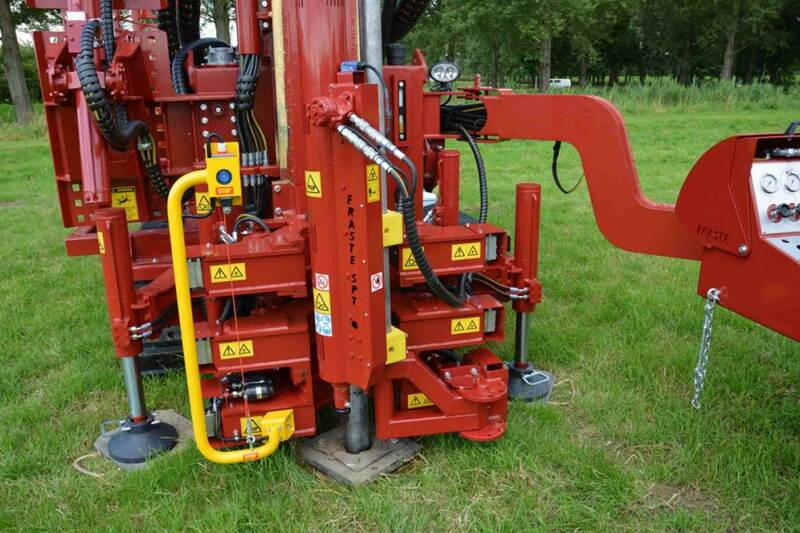 A break out clamp mounted at the base section of a drill mast means that the breaking of casing or rod connections is rapid, safe, sure and ergonomically friendly. The casing is pulled up in such a way that the bottom and top clamp can clamp the bottom and top casing. Then the cylinder that rotates the upper casing is operated to break the connection. The top clamp is loosened to allow the drill motor to untwist the top casing further. The top clamp is closed again which allows breaking and completely untwisting the drill head spindle from the top casing. Then, the top casing is lifted and stacked by hand or with a manipulator. The drill head is lowered on the bottom casing (which is still clamped in the lower clamp) and twisted in. The lower clamp is loosened and the casing is pulled up. This sequence is repeated until all casing sections or rods have been removed. You can choose from two types: The lighter type allows clamping 50-200 mm casing and is meant to be build on CompactSonic rigs (not for SonicMast CRS-T or CRS-P). The heavier type (50-280 mm) is meant for MidRotoSonic and LargeRotoSonic units. Of course you can bolt them on any rig working with casing or rods with these dimensions. These are heavy duty clamps equipped with oversized bearings and hydraulic parts. The construction is based on many years of experience and intensive use. All parts are exchangeable. Grip bit inserts can be field exchanged within minutes.